For more than 75 years now, Life'sWork of Western Pennsylvania has worked effectively to assist people with disabilities or other barriers to employment. The goal is to find productive jobs, but the result is the creation of dignity and independence. And the method? Creativity. (Those Jurassic dog bones they package for supermarkets have been a huge hit with local canines!) Creativity has been brought to bear on their fund-raising, too. With a nod to tough economic times, Life'sWork has decided to combine its two annual events into one big hoedown. On June 12, they'll bring in Perini Ranch Steakhouse to re-create the Congressional White House Barbecue at Heinz Field. With Dave Alexander's Western swing music, Tom Perini's chuckwagon, cowboy entertainment and chair Attila Molnar, CEO of Bayer, it promises to be a great evening. 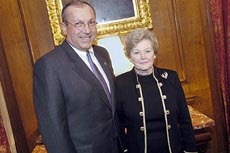 At a reception held Tuesday at the Duquesne Club, Life'sWork kicked off the barbecue and announced the 2004 winners of two awards. The Joseph F. Mulach Jr. Award recipient is Ralph Papa, regional president of Citizens Bank. Highmark CEO Dr. Ken Melani will receive the James F. Compton Humanitarian Award. Applauding their efforts were Larry Stern, Earl Latterman, Lee Noble, Darlene and Angelo Spagnolo, Michael Roeschenthaler, Steve Irwin, Joanne Andiorio and Grace Compton. For information on the barbecue, call 412-471-2600. They've appeared onstage together as Batman and Robin, and as Peter Pan and Tinkerbell. WQED Multimedia president George Miles in a tutu is a tough act to follow, and he joked that everyone can't wait to see what ridiculous costume he'll wear this year. 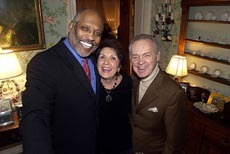 But Elsie Hillman wasn't about to spoil the surprise when she announced the recipients of the 2004 Elsie Awards at a kick-off party held Thursday in her home. The semi-annual event benefits children's programming on WQED and honors people who have made a difference in three areas: community, compassion and communications. Receiving awards at the gala on April 1 in Carnegie Music Hall will be Drue Heinz, "Sesame Street" creator Joan Ganz Cooney, Rob Marshall, Joe Negri and Homeland Security Director Tom Ridge. Among those enjoying a festive holiday buffet and the warm hospitality offered by Elsie and husband Henry Hillman were Joe and Joni Negri, County Executive Jim Roddey, Dan and Pat Rooney, Jim and Suzy Broadhurst, Tom and Marilyn Donnelly, Dwight and Karen Farmer White, Janet Miles, Brooks and Jean Robinson, Audrey Hillman Fisher and Jim Rohr, CEO of PNC Financial Services, major sponsor for the awards (which will also celebrate WQED's 50th anniversary). For information, call 412-622-1371. 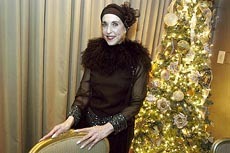 Patriotism mixed with merriment at Amen Corner's annual holiday party at the Duquesne Club on Wednesday night. After event chair Diane Mohr welcomed 231 of the organization's members, Christine Frattare sang the national anthem a cappella. Pennsylvania Lt. Gov. Catherine Baker Knoll praised outgoing Amen Corner president Tim Heffner for his work in increasing the organization's membership, now at 397 strong, as well as his support of local charities. Amen Corner member Mervat Abdelhak presented $14,000 in scholarships awarded by the organization to three college students: Tammy Ohm of Carlow College, Kimberly Robinson of Duquesne University and Matthew Lawniczak of La Roche College. Amen Corner also honored Dr. Ken Melani, president and CEO of Highmark, with the Fred E. Obley Award for Melani's contributions to the business community. 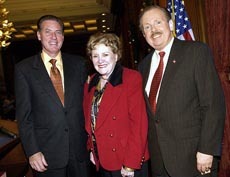 Former Allegheny County Commissioner Larry Dunn, a 20-year member of the organization, was sworn in as the Amen Corner's new president for 2004. Amen Corner, the city's oldest old boy network, boasts a good number of prominent women who enjoyed the festivities, including Recorder of Deeds Valerie McDonald Roberts, Attorney Jean Manifesto, Susan Castriota Hamilton, Christina O'Toole and Dr. Lori Cherup. Its productions never disappoint, and Monday night's Civic Light Opera Guild's seasonal soiree, "Holiday Reflections," was no exception. The scenery was heaven-sent. Back-lit by a full moon on the clearest of nights, guests partied above it all on Mount Washington at the Le Mont restaurant. The famous venue with a view wasn't the only thing to get top billing. Event chair Violet Gallo(with Robert), looking dramatic in black, and her committee were thanked by guild president Patti Matty (with Paul). Rick Purcell and his band provided the evening's soundtrack, a mix of holiday tunes, jazz and dance floor standards. 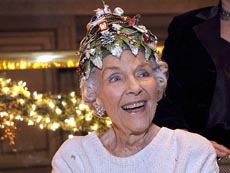 Playing pivotal roles at this annual party were guild chair Connie Rockwell, in her famous Christmas tree hat from the old Horne's department store, and Dolores Bold. A great supporting cast included Terri and Don Hastings, Janet Palumbo, Pam and Ken McCrory, Judy and John Woffington, Dottie Florence, Herbert O'Dell, Dr. Don and Mary Lintner, Irene Walker, Anne and Jim Speitel, Ann Baldridge, Marie Ganassi, Frank and Connie Donnelly, Bobbie and Ralph Aiello, Joe and Amy Steinmetz, Dr. Michael and Norma Sobel, Janice and Ernie Meade, Barb Mendlowitz, Arlene and Barry Sokolow and CLO director Van Kaplan. As the Monongahela River rolled by outside Monday night, guests inside the Sheraton Station Square were listening to a roll call of awardees at the annual Achieva Awards of Excellence reception. KDKA-TV's Yvonne Zanos welcomed the more than 200 guests who came to celebrate outstanding efforts in volunteerism and leadership. CEO Marsha Blanco received special recognition for 25 years of service with Achieva (formerly ARC Allegheny). Individuals being honored included David Donohue (Volunteerism Award), Nancy Hubley (Professional Service Award), Christopher Grandy (Personal Achievement Award), Mel Delposen (the Joe Ott Award for outstanding vision and leadership), Sister Mary Thaddeus Markelewicz (the Sattler Humanitarian Award) and state Rep. Mike Veon, who was unable to attend (the Legislative Award). Organizations that were spotlighted included the Shannon Safety Products Co. and the Bottle Shop. Among those cheering these champions of good works were board chairman Joe Ott, Marc Cherna, Dr. Norman and Margaret Mulgrave, Gary Fleming and Nancy Green.